Sweet, earthy beets make a delicious base for fresh salads. While plain beets are tasty simply dressed, these sweet root vegetables are easy to kick up a notch with a handful of crunchy nuts or a few bits of salty cheese. Beets are also lovely when tossed with greens or paired with citrus fruits. Find delicious ways to use beets in salads and tasty recipes below. Toss crisp escarole and sweet beets to create an easy salad full of crunch that's perfect with warming fall and winter meals. I particularly like to serve this salad for a contrasting freshness when a stew or another of the intensely flavored, long simmering dishes I cook on cold nights is on the table. Roasting intensifies the sweetness of beets, making them the perfect foil for salty feta cheese in this simple and nutritious composed salad. You can roast the beets well ahead of time, but add the feta right before serving - the bright white cheese has a way of soaking up the magenta color of the beets in a jiffy (you can see it happening in this photo!). Make it even prettier by serving this simple salad on a bed of arugula or baby lettuce leaves. 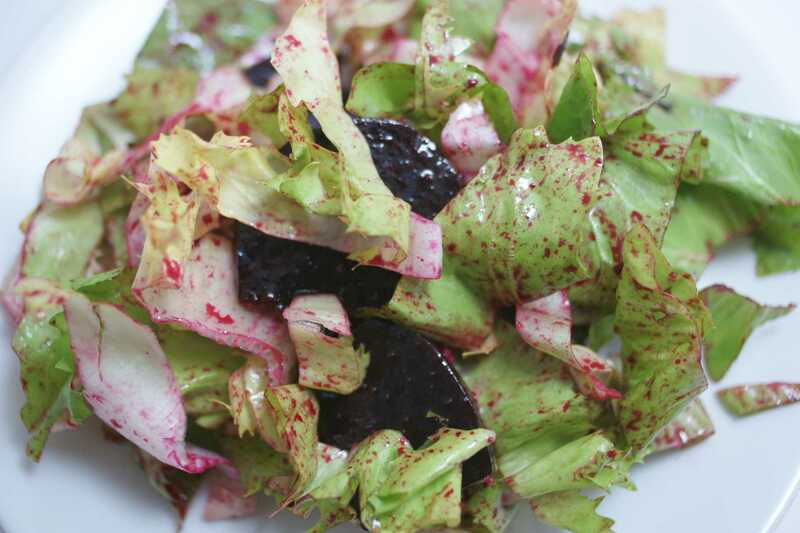 This salad can be made with roasted or grilled beets and is easy, fresh, and delicious. As with the above salad, don't add the cheese until you're ready to serve this salad (unless, of course, you want pink cheese, which definitely has its appeal). A sprinkle of minced green onions or chives is lovely on this salad, too. The nutty taste and crunchy texture of hazelnuts echo the earthy flavor of roasted beets in this simple salad. If you can find hazelnut oil, use that in the dressing for an extra noisette (that's French for "hazelnut") kick. Walnut oil is another tasty choice, as is plain (i.e. not toasted) sesame oil, which has a cleaner, less nutty flavor. Sweet beets and tangy oranges make an easy, colorful, and refreshing salad on the shortest of winter nights (it works well into spring, as long as juicy citrus is still available). A dollop of thick, unsweetened yogurt is optional, but highly recommended, as it marries the sweet and tart, the fruit and vegetable. ﻿A smaller spoonful of crème fraîche would have the same effect. Creamy, yummy whole milk ricotta is especially delicious with beets, but the part-skim version is fine is that's what you prefer. You can use roasted or grilled beets here; know that the charred bits on grilled beets provide an extra tasty contrast to the milky flavor of the ricotta. This simple salad of shredded roasted beets is dressed with just vinegar and salt, which highlight the wonderful deep, earthy sweetness of the beets. Serve it on its own or over lettuce, or as a side dish perfect next to roast meats (particularly chicken or pork). Roasted beets and walnuts are turned into a delicious salad with just a drizzle of walnut oil and a sprinkle of salt. Toasting the walnuts is optional, but definitely intensifies their flavor and crunch. Using walnut oil is in the dressing is a delicious (and obvious!) choice. Make this salad when you have a perfectly fresh bunch of beets with their vibrant greens still attached. The warm roasted beets wilt the beets greens a bit, for a lovely contrast of cooked and raw. Leave it simply dressed with a bit of olive oil and salt, or add lemon zest, chopped hazelnuts, or feta or goat cheese if you want to dress it up a bit for company. Grated roasted beets tossed in a garlicky yogurt dressing create a shocking pink color when you use red beets and out-of-this-world flavor. The one pictured here used striped beets for a more delicate effect. Use this unusual creation as a dip with toasted pita or crackers, or serve as a side salad with Mediterranean dishes. Seriously, don't let the color put you off, this simple salad is amazingly sweet and garlicky at the same time.﻿ In my experience, people slurp it up (after they make a bunch of comments about the color, of course).